Product Managers and Product Owners are at the epicenter of enterprise transformations, and their performance and knowledge of SAFe makes all the difference when it comes to delivering on the promise of value that is achievable through adopting SAFe. 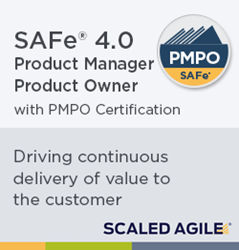 Scaled Agile, Inc. (SAI), provider of the Scaled Agile Framework® (SAFe®), today announced the release of a new course, SAFe 4.0 Product Manager / Product Owner with PMPO Certification. The two-day course has been fully updated to leverage the latest benefits of SAFe 4.0, and provides an in-depth understanding of how the Product Manager (PM) and Product Owner (PO) roles operate in a SAFe enterprise to support product development flow and drive the continuous delivery of value to the customer. Individuals who would benefit from this course include: Product Managers, Product Line Managers, Product Owners, Business Owners, and Business Analysts. Others include Solution Managers, Portfolio Managers, Program Managers, Architects, PMO personnel, and Process Leads. Public classes and registration information can be found at scaledagile.com/calendar. Based in Boulder, Colorado, Scaled Agile’s mission is to help system and software-dependent enterprises achieve better outcomes, increase employee engagement, and improve business economics through adoption of Lean-Agile principles and practices based on the Scaled Agile Framework® (SAFe®). SAI supports tens of thousands of practitioners of the Framework through training, certification, consulting services, and a global partner network that reaches over 35 countries and 350 cities. As a contributing member of the Pledge 1% corporate philanthropy movement, SAI also seeks to inspire, facilitate, and encourage other companies to make a positive impact in their community. To view SAFe case studies, visit scaledagileframework.com/case-studies.